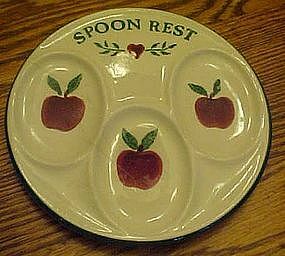 Spoon rest in the apple pattern by Crock shop. Measures 6" in diameter with the green trim. This one does have a long crack which does not go all the way, therefor has never had to be repaired. Thus reflects the discounted price. Look closely and you can see it in the photo.